I remember asking Richard if it was possible to make a Zero Plot bigger. The answer is yes, but, you cant' throw dirt at the edge and expect it to stick. what you have to do is dig a trench through to the bottom of the plot, and somehow push the two parts apart. The best place to try this is at the edges of the plot, as that's where it's the thinnest. You need to keep the edge connected to the plot, so perhaps some sort of scaffolding or a beam secured across the trench. In fact, if the beam is hooked up to a piston of some sort, it could be the thing that pushes the two sections apart. You can't fill the trench up with dirt, as it will just fall through. You have to wait until the plot lands somewhere, and then get that bobcat going and fill that trench up with new dirt. When the plot leaves, it takes the dirt with it. Rinse and repeat. Unless you compact the dirt as you put it in, it will be loose soil and can dribble away. So compact it while your on a world. Or.. fill the bottom of the trench with concrete. That lets you compact the soil in your leisure. How big can you make it? I had my players hear from some survivors of a plot nearly a mile across. Think about that for a second. This would help extend the life of the campaign allowing space for new buildings and greenhouses for food. 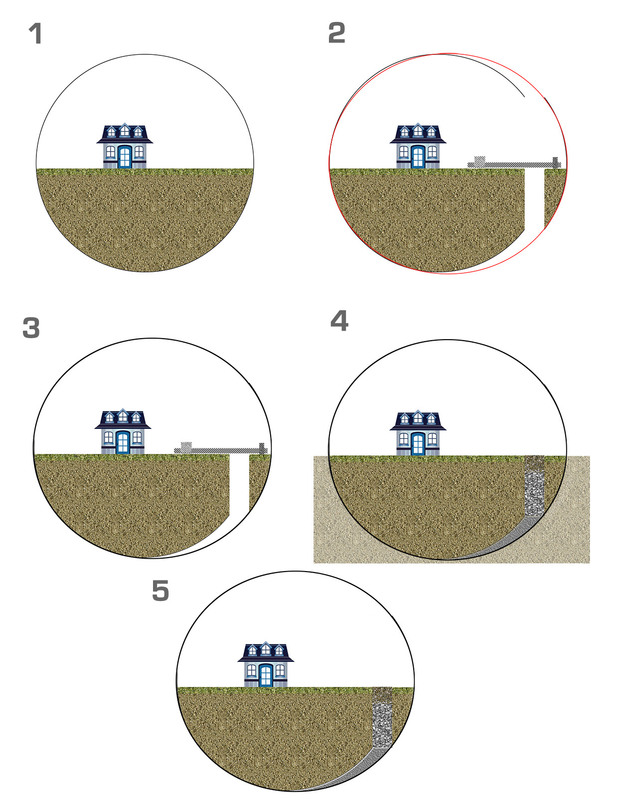 Short water towers or cisterns could also be placed in the gap. I really like the idea of cement being the base to avoid erosion of the new section, although getting all the needed equipment and materials would be time consuming and would require adventures that were meant to allow a chance to gain them. Well, yeah, that's the trick. Getting the cement. The first time you do this, it will probably be tamped earth, but that means you don't do anything else but fill the trench with dirt and compact it. It has to be compacted otherwise it will be treacherous and crumbly. Falling through the trench is a lesson you'll never forget. how about building a skeleton of metal along the edge attached to soothing really solid like the fact our zero plot has part of a paved road running through one side? could we build off connecting to the road and fill in solid before taking off? it seems like it might work since it wouldn’t be just tossing dirt on the edges. A road would work as a secure place to put the booms that push the plot apart. Might have to cut down the middle of it so you have solid footing on either side. But as you push the plot apart, you'll have to move the foundation for one set of booms closer to the edge again. I really should do an illustration of what it would entail. OK, I did an illustration and saw some issues I hadn't thought about. The "bubble" that encloses the zero plot stretches and there's now a gap under the edge of the plot. The plot bubble is a perfect sphere. Dig a trench while in Weirdspace, and then push the edge away using a boom arm. The bubble stretches and reforms, with a gap under the edge of the plot. This gap will get smaller the wider you make the plot. The plot lands, and unless the edge collapses, you'll have to fill it with something. Cement is good idea, topped with some sort of fill, then dirt from the world you landed on. Back into Weirdspace and the cement cures as it can't fall off. Rinse and repeat.